Party with The Green Girls -- and 200 green-thinking Angelenos -- at the Ecco Lounge in Hollywood this Saturday. 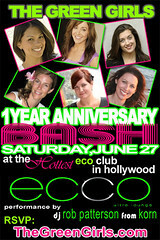 June 24, 2009, 12:31 p.m.
Want to party at Ecco Lounge, the eco-friendly Hollywood club, while dancing drinking organic vodka cocktails with 200 other environmentalists? Then clear your Saturday night for the The Green Girls’ 1-year anniversary bash! Cost: $15 — an unspecified portion of which’ll benefit the Leukemia & Lymphoma Society. RSVP online!